First I want to welcome you to my product site. I hope that you enjoy it and I KNOW you will gain so much from the products and information that is available here for you. It is always been my goal to help other entertainers to help themselves by giving them the products and tools to seek greatness. - Kyle is both an S.A.M and I.B.M Stage Contest Assembly Winner numerous times as well as a stage and close up judge for the S.A.M National Convention. - Kyle is a respected performer and performs regularly over the east coast with his wife Kelly. 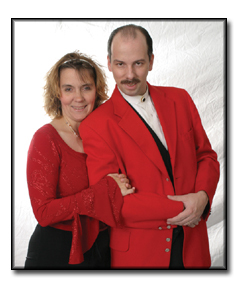 They specialize in family-friendly magic and illusion shows for a variety of clients and markets. - Kyle is an author of numerous articles in relation to various aspects of the Performance & Presentation of Magic. - Kyle has written close to 200 articles as a weekly columnist for Alan Watson's magic NZ Ezine for over the past 4 years. - Kyle is also a featured columnist for Sammy Smith's Funny Paper Magazine as well as Paul Rohmany's Magic Blog. - Based on his own childhood and personal experiences, he is acclaimed as a Story-Telling magician. - Kyle is also a professional Graphic Designer and Illustrator and an expert on Logotype Design. Highly experienced in creating designs for business cards, letterheads and promotional leaflets and brochures. - Kyle is also a mentor and SYM instructor and assists with youth activities each year at the S.A.M National Convention. - Kyle is also the recipient of The Charles Hopkins Award for Magical Excellence and is one of the youngest people to receive this honor. Most of all, I am an educator. I want to make sure that everything I put out there is top-notch in quality and in the information i share. I want YOU to have the tools you need to seek your goals and dreams.